Figure 1. 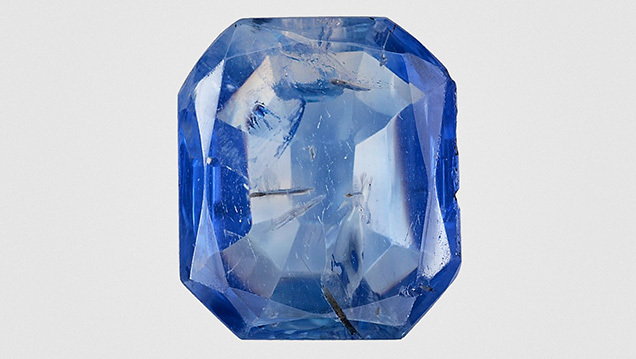 This 14.06 ct octagonal blue Kashmir sapphire exhibits large, eye-visible inclusions of prismatic pargasite. Photo by Towfiq Ahmed. Kashmir sapphires are known to have occurred in kaolinized plagioclase feldspar pegmatites, found as pockets between metamorphic stratified beds/cliffs of the Himalayan Zanskar Range. These sapphires captured many cognate mineral inclusions—such as pargasite, plagioclase feldspar, tourmaline, and zircon—which demarcate the pockets against the country rock (E.J. Gübelin and J.I. Koivula, Photoatlas of Inclusions in Gemstones, Vol. 3, Opinio Publishers, Basel, Switzerland, 2008, p. 194). Pargasite mineral inclusions (prismatic or as long, fine needles) in blue sapphire are regarded as a strong indicator of Kashmir origin. (R. Schwieger, “Diagnostic features and heat treatment of Kashmir sapphires,” Winter 1990 G&G, pp. 267–280). Recently, a 14.06 ct octagonal-cut blue sapphire (figure 1) submitted to GIA’s Carlsbad laboratory for origin determination was of particular interest for its several unusually large, eye-visible pargasite crystal inclusions. Standard gemological properties confirmed the host sapphire’s identity, and advanced analytical testing specified its metamorphic geological origin. Microscopic examination revealed an inclusion scene reminiscent of “new Kashmir,” a term referring to Kashmir sapphires that have come into the market since the 2000s. 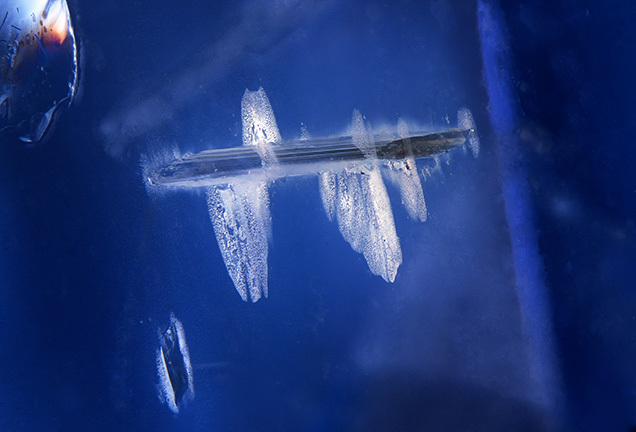 The blue sapphire featured several negative crystals, black graphite inclusions, unidentified rounded and needle-shaped colorless crystal inclusions (probably slender zircon rods or pargasite), reflective thin films, and fluid fingerprints. Classic Kashmir sapphire features were also observed, such as “milky” turbid whitish broad bands, clouds, a parallel chromium-enriched zone (which glows red under long-wave UV illumination), ladder-like/antenna-like stringers, and snowflake-like inclusions. Figure 2. A large prismatic pargasite mineral inclusion. Photo by Jonathan Muyal; field of view 7.19 mm. Figure 3. Unoriented Raman spectra with 514 nm excitation confirmed the pargasite mineral inclusion identity (blue spectrum), using the RRUFF database as a reference (red spectrum). The main inclusion features, the pargasite crystals (figure 2), were transparent with a brownish green bodycolor. Many of them were doubly terminated with a flat, columnar prismatic morphology with striations along their length, surrounded by halo- or rosette-like thin reflective films. The pargasite crystal’s surface pits and altered appearance suggested that these pargasite crystals were protogenetic inclusions present in the pegmatitic growth environment before the sapphire began to form. Raman microspectrometry analysis (figure 3) confirmed the identity of several crystal inclusions as pargasite. The absence of 3309 peak series in IR spectroscopy and the microscopic observation of unaltered internal features supported an unheated call. The classic metamorphic UV-Vis absorption spectra, the metamorphic-type low-Fe chemistry data collected with Laser ablation–inductively coupled plasma–mass spectrometry (LA-ICP-MS), and the observed inclusion scene supported a Kashmir origin conclusion. The issued GIA report identified the stone as a natural sapphire from Kashmir with no indications of heating. Pargasite was once thought to be unique to Kashmir until it was found in sapphires from other countries. Nonetheless, pargasite inclusions are a strong indicator of Kashmir origin. With the support of advanced analytical instrumentation (UV-Vis and LA-ICP-MS) in addition to careful examination of the overall internal features (milky bands, ladder-like stringers, and snowflakes), the presence of pargasite inclusions can conclusively determine a Kashmir origin. Jonathan Muyal is a research stone collection gemologist at GIA in Carlsbad, California. The locality origin of natural-color blue sapphires from Kashmir can, in many cases, be positively identified.